International Marine Publishing, 9780071424011, 291pp. Americans called it "Torpedo Junction," Germans "Devil's Gorge," but historians know it as the Battle of the Atlantic--the four-year Allied struggle to move desperately needed supplies from America to Europe through devastating assaults by German U-boats, ships, and aircraft. 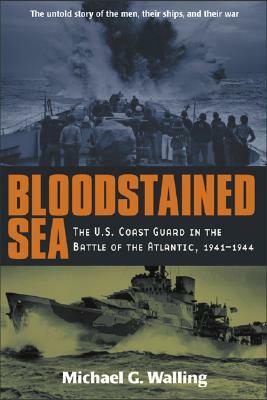 Now for the first time, Bloodstained Sea describes in vivid detail the heroic actions of the Coast Guard ships that defended Allied convoys en route through the North Atlantic to England and Russia. Eyewitness accounts assembled from hundreds of interviews propel this breathtaking, meticulously researched plunge into the thick of a battle fought mostly in the frozen seas east of Greenland. There, courageous but overmatched Coast Guard escorts braved the torpedo attacks of U-boat wolf packs to rescue thousands of men while thousands of others perished. Told in the voices of the men who lived it, this epic drama reveals the indomitable fighting spirit of the World War II Coast Guard.